Coconut is used in every meal in Sri Lankan households in one form or another; from coconut oil, pol sambol to kiri hodi. However, over the years, the coconut oil manufacturing processes have changed from the methods used decades ago in the villages, resulting in fair trade products made from coconuts. To put his ideas on fair trade coconut products into practice, entrepreneur Noel Randeniya of Bemmulla, Gampaha transformed his coconut oil business to virgin coconut oil and coconut flour manufacturing by setting up a factory in 2014. When Mr. Randeniya started his coconut oil business on a very small scale in 1982, he knew nothing about the potential of virgin coconut oil. Randeniya oil mills was established in 1984 as coconut oil expelling mill and it was upgraded to Randeniya International (Pvt) Ltd in 2008. In 2014, Mr. Randeniya has set up a factory – with great success under the management of his son Nipuna to produce and market virgin coconut oil and coconut flour both here and overseas. 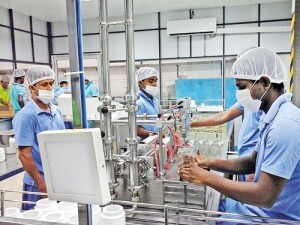 With a staff of around 40, the company has acquired necessary technical knowhow on Virgin coconut oil production within a short period, Nipuna Randeniya told the Business Times adding that food safety is the responsibility of all employees who have direct influence on manufacturing, storage and the transport of products. Virgin coconut oil has great demand overseas as it can be used as anti-fungal, antibiotic, weight control, sports nutrition, cardiovascular health, skin health and beauty, nutritive and culinary, he pointed out. Mr. Randeniya disclosed that his company is exporting virgin coconut oil to 36 countries including Germany, England, Australia, Switzerland and Ireland. The company’s products have been tested for high quality at Eurofins laboratory in Germany which is an international life sciences company that provides a unique range of analytical testing services to clients across multiple industries, he revealed. The company was awarded the ‘Western Province Best Entrepreneur Award 2016’ by the National Chamber of Commerce, in conjunction with the National Enterprise Development Authority at an event in Colombo recently.